This is the first pencil skirt I've worn to my job since starting in October. Somehow the span between a pair of jeans and a pencil skirt just seems so vast. But I'm making more of an effort to bridge my office style gaps and throwing on one of my favorite pencil skirts with some basics seems like the perfect way to do just that. I love a pencil skirt and that color looks great on you, love the look! Yayy! Such a pretty colored skirt! And isn't it funny how when you haven't worn something in a while it feels super weird or dressy? This is pretty great office style - you look perfect (I seriously love that skirt, and I'm not usually one for bright colors). The space between jeans and a pencil skirt is enormous. And I have to admit, if I worked in an office where jeans were allowed, I doubt I'd ever wear anything else, so I admire you for taking the plunge on true work wear and breaking out a pencil skirt. You really did choose the perfect one to start with, the turquoise shade is so cheerful that I feel like you almost wouldn't remember you had given up your jeans for a day to wear it. Oh the Worthington mint skirt… it seems like a great idea to work that gap. I'm with you! It's so difficult to remember to wear pencil skirts, even though they are pretty cute. Love the necklace! That skirt looks incredible on you!!! I love the mint! What a lovely shade of mint! You definitely need to pull out your pencil skirts more often! That's a prett pencil skirt on you, the color is so pretty and the toggle adds a fun element. It's nice that you have an office that's more lenient in dress code and be able to wear a variety to the office. That pencil skirt fits you perfectly, love the color! That is a gorgeous pencil skirt. I love the aqua color. The necklace and clutch are quite amazing too. I have heard great things about the Worthington pencil skirts. Do you recomment tht brand for their pencil skirts? The skirt is so pretty on you! I love that color! such a fresh take on elegance! Love the color pop! The turnlock detail is such a sassy little embellishment. I'm all about making work clothes more fun and interesting and this nails it. What a great color on you- I don't break my pencil skirts out nearly enough, either! 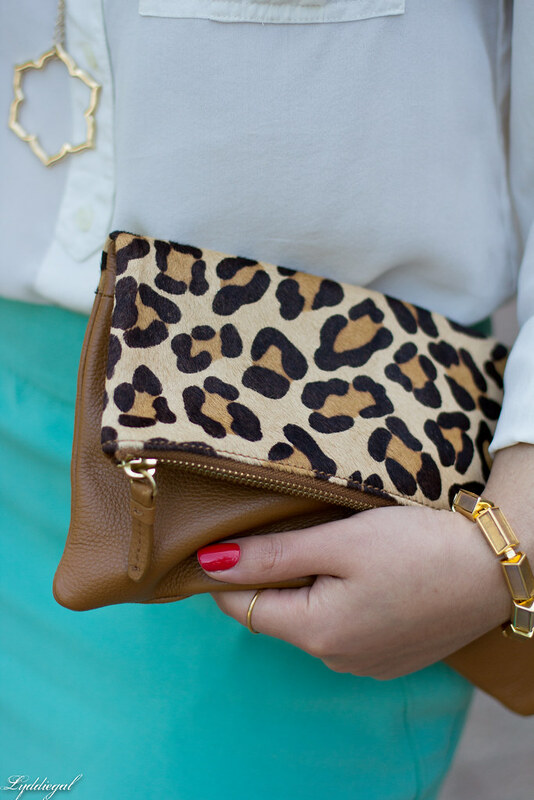 The pencil skirt pairs beautifully with the leopard clutch! Those two are definitely classic items! 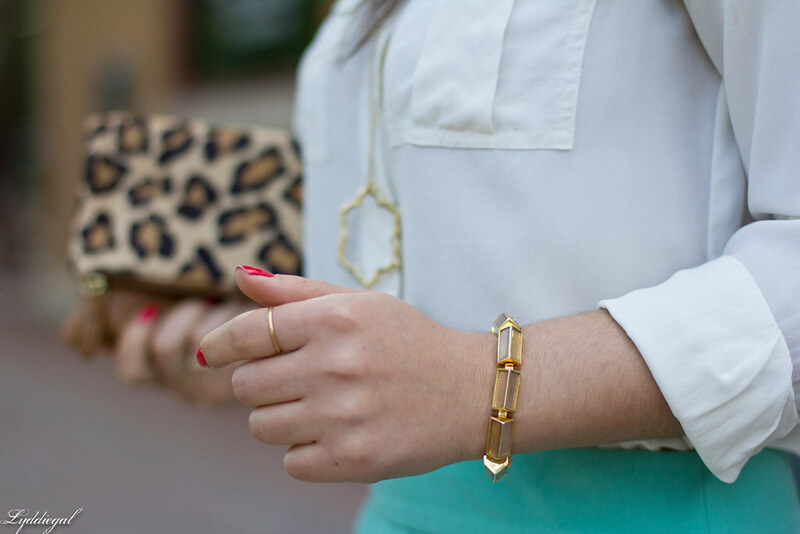 This is just beautiful -- I love the leopard/teal pairing, and your ILJ necklace is so cute with this. ps: MAJOR steal on your new jewels and D&B bag. I love the color of that pencil skirt! It's very stunning. Love your necklace! I love this--it's simple and classic, and doesn't look TOO dressed up either. My office is fairly casual (a lot of people wear jeans, but I tend to keep it business casual) so I feel SO dressed up when I break out the pencil skirts on just "regular" (no visitors, no meetings) days. I like this look for bridging that gap! You always could rock a good pencil skirt. Surprised you haven't worn one in so long... you always wear them so effortlessly and make them look breezy, however the heck you do that. You're a magical lady, you are, Lydia! And that shade of mint is so pretty.